This primer on how to hack the media zeitgeist is so incredibly accurate, it just might render mainstream media completely useless. As opposed to mostly useless like it is now. When playing for high stakes, Ryan Holiday is my secret weapon. His unique stealth manner makes him essential for winning. Ryan is part Machiavelli, part Ogilvy, and all results. From American Apparel to the quiet campaigns he's run but not taken credit for, this whiz kid is the secret weapon you've never heard of. Behind my reputation as a marketing genius there is Ryan Holiday, whom I consult often and who has done more for my business than just about anyone. Ryan Holiday is a man you should listen to... [He] has a truly unique perspective on the seedy underbelly of digital culture. Ignore him at your peril! The strategies Ryan created to exploit blogs drove sales of millions of my books and made me an internationally known name. The reason I am standing here while other celebrities were destroyed or became parodies of themselves is because of his insider knowledge. Ryan Holiday's absolutely brilliant expose of the unreaility of the Internet should be required reading for every thinker in America. While I was thinking of the best books to add to this short list, I realized that not even half of them are directly related to digital marketing. This is because I believe that the best marketers are people who understand human nature deeply and aim to bring out the best in it. Call me naive, but that’s how I see it. If I were to want to pursue a career in marketing, I’d read [...] Trust Me, I'm Lying. 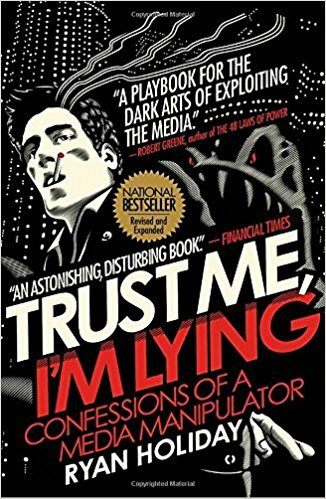 This year I finished reading “Trust me, I’m lying” from Ryan Holiday and it made me think how to use the media, content and other tactics to help the company I work for to be more present on the internet. I know that Ryan wrote that book a few years ago and the social media, blogging and online marketing mediums back then were very different, but there were a few simple ideas that made me take my laptop and start working, even in the middle of my reading moment. I believe these are the books worth reading and recommending. As a former automotive blogger/journalist this was an interesting read considering this kind of stuff was seen by myself and my coworkers on a daily basis. You've seen it all before. A malicious online rumor costs a company millions. A political sideshow derails the national news cycle and destroys a candidate. Some product or celebrity zooms from total obscurity to viral sensation. What you don't know is that someone is responsible for all this. Usually, someone like me. I'm a media manipulator. In a world where blogs control and distort the news, my job is to control blogs-as much as any one person can. Why am I giving away these secrets? Because I'm tired of a world where blogs take indirect bribes, marketers help write the news, reckless journalists spread lies, and no one is accountable for any of it. I'm pulling back the curtain because I don't want anyone else to get blindsided. I'm going to explain exactly how the media really works. What you choose to do with this information is up to you.